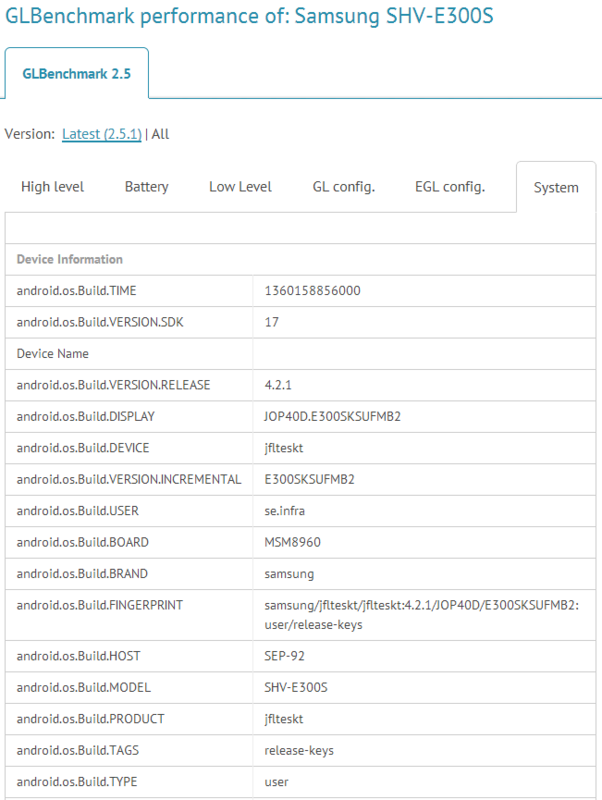 The Korean variant of the Galaxy S IV (SHv-E300S) has just made an appearance in GLBenchmark. According to the benchmark, the device features a Full HD (1920×1080) Display with no on-screen navigation bar. There is something interesting in the benchmark as well, a Qualcomm CPU and GPU. It looks like the device packs a Qualcomm MSM8960 CPU clocked at 1,9GHz (384 – 1890MHz) and an Adreno 320 GPU. The device also runs on Android 4.2.1 Jelly Bean (JOP40D), firmware E300SKSUFMB2. This benchmark could actually be a hoax as the device packs a Qualcomm CPU and Samsung would never use a Qualcomm SoC in their high-end smartphone but we are not sure. The Galaxy S IV is rumoured to feature an Exynos 5 Octa (8-Core) CPU, Mali-T678 (8-Core) GPU, 4.99″ SuperAMOLED Full HD Resolution Display, 2GB of RAM, 13 Megapixel Rear facing Camera capable of shooting 1080p Full HD Videos at 30FPS, 2 Megapixel front facing camera capable of shooting 720p HD Videos and run Android 4.2.2 Jelly Bean out of the box. just flash the leaked 4.1.2 jelly bean for your N7000, it works OK for me, waiting for the official update. I don’t know how about any one else here but my S3 is getting worse and worse. It glitches more and more. My friends S3-s are even worse. This is trash. @rezashayaaaaan2 root your f-ing phone you whining little kid.